Aslockton Castle, which is also known as Cranmer's Mound, was a motte-and-bailey fortification built in the late eleventh or early twelfth century. It later evolved into a manorial site with the earthworks of the former castle being re-used as a series of fishponds. By the sixteenth century the motte served as a viewing platform overlooking a formal garden. Aslockton was an existing settlement long before the Norman Conquest with its original name, Aslachetone, suggesting Norse origin. The Domesday survey of 1086 listed it as a large settlement. 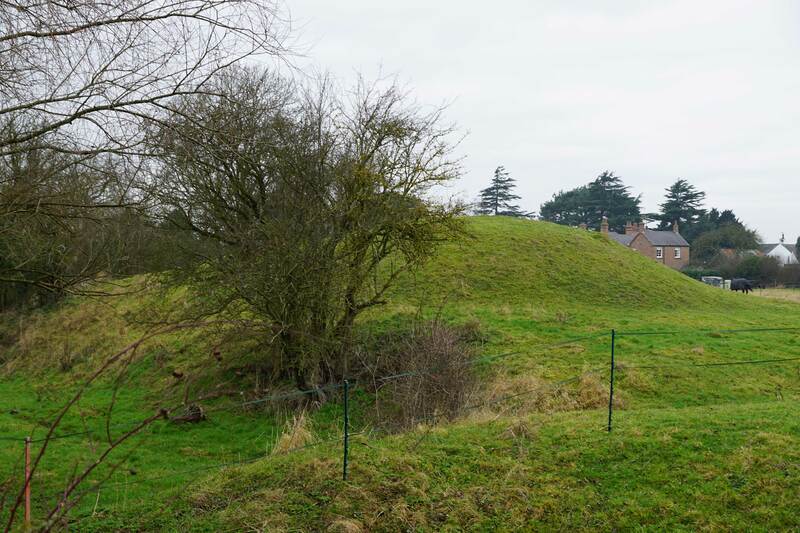 Precisely when the castle was raised is unknown but it was an earth and timber motte-and-bailey fortification and thus almost certainly built in the late eleventh or early twelfth century. The motte would have been topped by a wooden tower and palisade. The fortification had two baileys both located to the east of the motte. The Inner Bailey was a broadly rectangular enclosure and would have presumably hosted the ancillary buildings associated with such a settlement. Beyond was the Outer Bailey which was marginally smaller (although it have may extended beyond the area of the earthworks seen today) and perhaps used for livestock. All elements were enclosed by water filled moats that were fed by diverting a nearby stream. 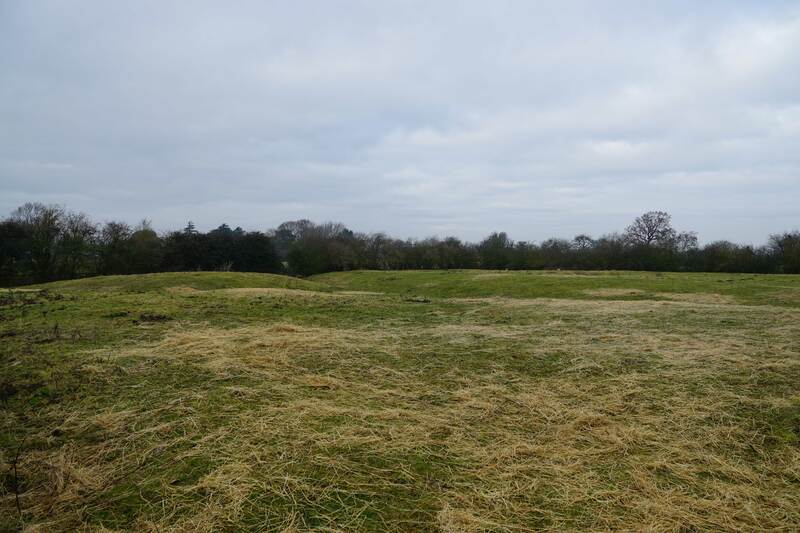 There is some evidence of a bailey or enclosure to the west of the motte. Precisely when the castle went out of use is uncertain but it clearly evolved into a manorial site and later into what has become Saucer Farm. At some point during the medieval period the manorial centre was moved from the castle to a new location. 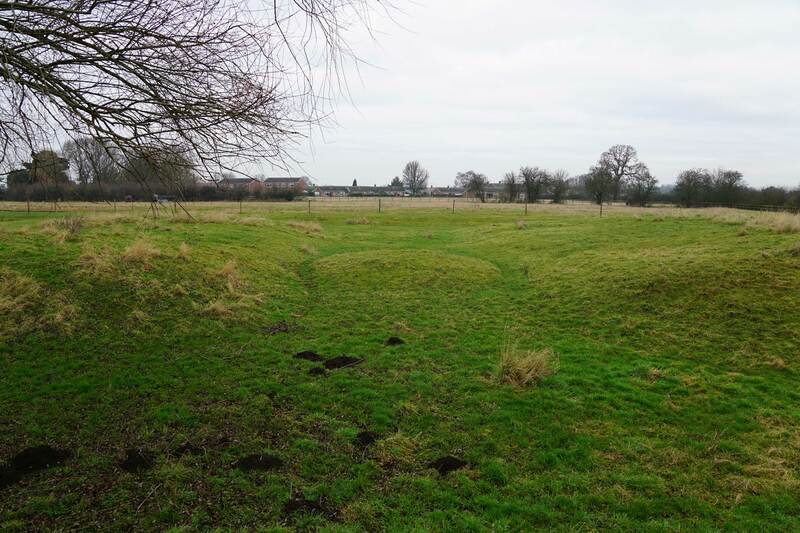 The abandoned earthworks of the two baileys were then remodelled to support a couple of fishponds, an important source of food for the medieval household. The external moat around the site wasn’t significantly altered but additional channels were added to the interior to provide water for the ponds as well as sluice gates to control the flow. By the sixteenth century a garden had been laid out around the ponds and the motte of the castle was used as a prospect mound. This was a common arrangement in contemporary gardens due to the increasing trend of planting Knot Gardens with elaborate patterns that needed elevation to appreciate them. The castle’s former motte served as a ready-made viewing platform. Today the garden has gone and the site of the castle is now used for grazing livestock. 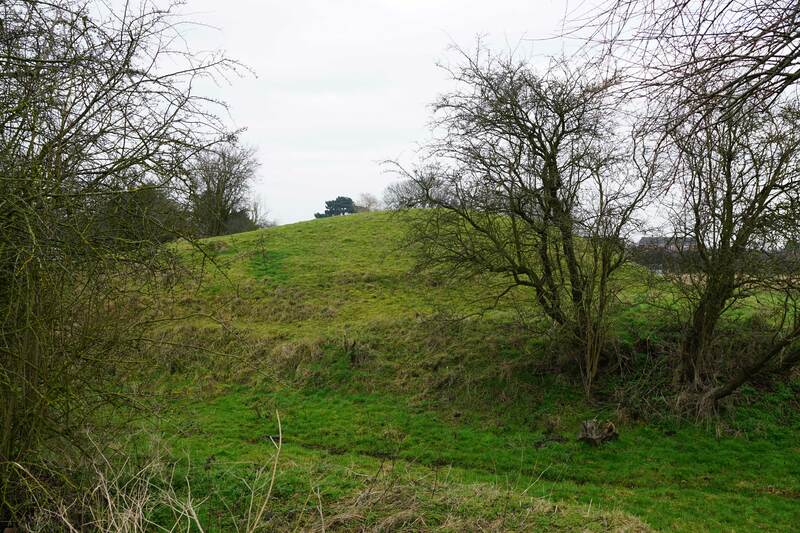 Aslockton Castle motte is known as Cranmer's Mound. This was named after Thomas Cranmer, Archbishop of Canterbury who was born at Aslockton in 1489, long after the castle itself went out of use. His family owned the manor having acquired it through the marriage of his grandfather, Edmund Cranmer, to Isabelle d’Aslacton. Thomas grew up in Aslockton and thereafter he studied at Cambridge before being ordained in 1520. Through his friendship with Stephen Gardiner and Edward Foxe, both counsellors to Henry VIII, he obtained the position of Chaplain to the King. He was appointed Archbishop of Canterbury in 1533 and immediately declared the King’s marriage to Catherine of Aragon to be null and void. He went on to sever the English church from Rome and, during the reign of Edward VI, led England down a Protestant path that paved the way for the current Book of Common Prayer. Cranmer’s Protestant beliefs meant he support Lady Jane Grey’s attempts to take the English throne following the death of Edward VI in 1553. However, the regime failed after just nine days and the people rallied around Mary I, a committed Catholic. Cranmer was arrested and charged first with treason, for which he was acquitted, and then for heresy. Under pressure he recanted his beliefs but refused to repeat this publicly and accordingly was burnt at the stake in Oxford on 21 March 1556. He held the hand that had signed the recantation and thrust it into the flames first. Historic England (2017). Cranmer's Mound, Listing Number 1009306. Historic England, London. 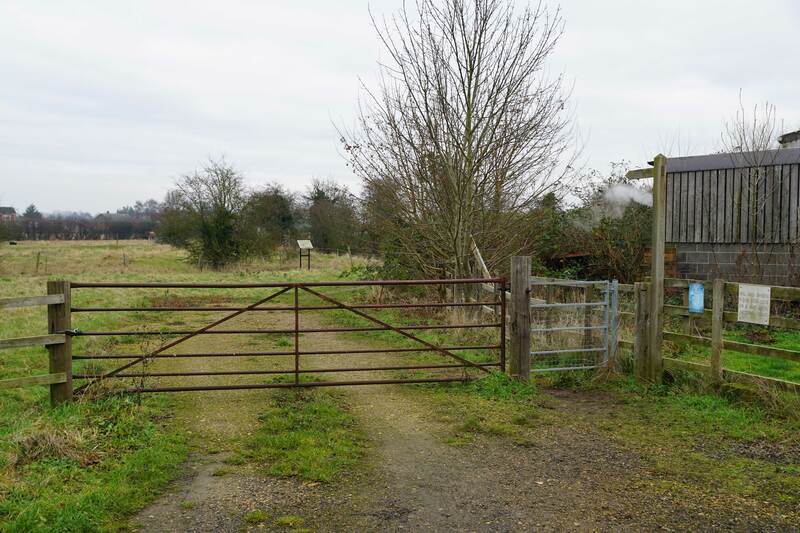 Aslockton Castle is on private property with no public access but the earthworks can be seen from a public right of way. However, the remains of the castle are much altered from the original eleventh/twelfth century structure and invariably represent its evolution into a manorial site. Motte. The motte still dominates the site but its south-east side has been damaged by ballast digging. Bailey Earthworks. Both the Inner (left) and Outer (right) baileys survive as low earthworks albeit ones extensively modified by later landscaping. Aslockton Castle is found in the village of the same name just off Main Street close to the Church of St Thomas. 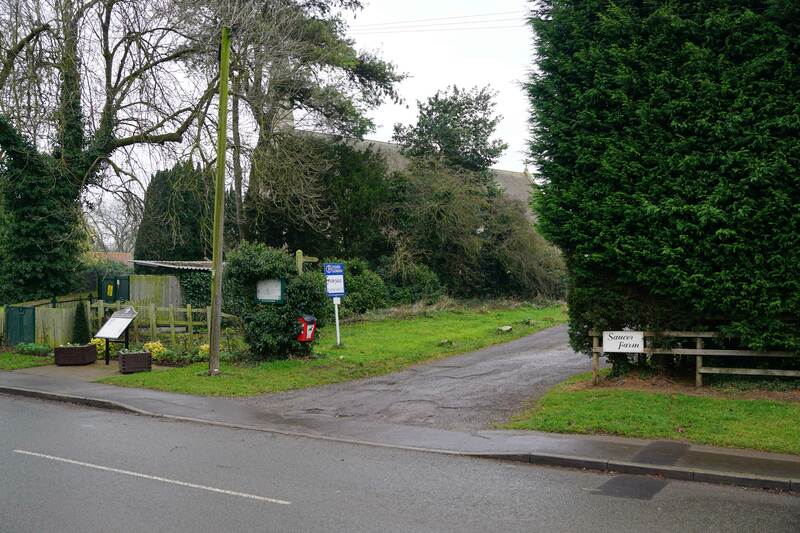 On-road car parking is possible in the immediate vicinity and then take the footpath towards Saucer Farm. The path to the castle is found between the Church and the Post Office and is marked as 'Saucer Farm'. When the road splits into two take the left fork to the castle site.